Camping isn’t just the all-American pastime-it’s one of the best ways to put your survival skills to the test, while enjoying yourself in the great outdoors. There are several skills that you can put to the test, even on just a typical family camping trip. 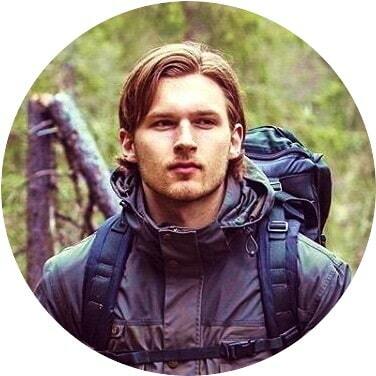 You can sharpen your insights of the necessities of sleeping under the stars, while honing skills that will help you survive in the wilderness. For areas that are accessible by a typical highway-legal vehicle, car camping is an option that many don’t consider. With just a few adjustments in practice and equipment, you can convert your vehicle into a safe, secure shelter that travels with you. With so many high tech tents and campers out there today, car camping has earned a reputation as something of a hobo’s practice. However, this is one way of camping that has some serious benefits, both over tents, and pulling around a 30 foot camper trailer. For one thing, car camping offers you much more security than a standard tent. While a nylon shelter may keep the wind and rain out, it won’t do much to keep a bear or cougar at bay. A car, with steel doors and shatterproof windshield, offers much better protection from predators. It’s also a factor to consider if you’re camping in popular areas, or even just spending the night at a rest stop. Unfortunately, people are some of the most notorious predators out there, and campers make easy targets for crimes like theft and assault. Camping in a car will offer you opportunities for greater security than even a typical camp trailer can offer, like locking doors, and a theft alarm. Here’s an obvious one. If you’re camping anywhere that’s accessible by a standard motor vehicle, spending the night in your car affords you the option to haul a lot more gear into your site. Not having to hoof it with pack frames means you can bring lawn chairs, sun shades, and barbecues, and then set up beds in the cargo area when all that’s out of the way. Then when you’re done, it’s as simple as shoving it all back into the trunk and driving away-no pulling stakes, no folding tents. In regards to this idea, we can recommend you the best camping chairs that will definitely make your outing a lot more comfortable and pleasant. One of my favorite things about camping out in my car is the option for temperature control. Sure, we I love the great outdoors, but I love it a little less when it’s 20 below zero. Even if you don’t plan to sleep in your back seat, having the option when unpredictable weather rears its ugly head is always nice. Just make sure you have enough gas to keep the heat on, and get back home. For some people, camping isn’t so much about recreation as it is about avoiding spending money on a hotel. If you’re on a long road trip, and just need a place to sleep, it doesn’t make a whole lot of sense to spend over a hundred dollars just to check into a hotel for the night. If you hit the road properly prepared, you can set yourself up a very cozy sleeping arrangement, and save yourself a hefty lodging expense. One thing to keep in mind though is that you plan to sleep in your car while you’re on the road, pick a safe location where it’s legal to spend the night. Rest stops are usually your best bet, since they’re well lit and have bathroom facilities. However, keep in mind that places like this can be magnets for crime. Make sure to lock your doors and park under a light. If there isn’t a rest stop nearby, often times big box stores won’t mind if you crash in their lot overnight. In fact, it’s not uncommon to see a line of camper trailers with cement blocks behind their tires in a Wal Mart parking lot. Whether such long term arrangements are legal is another story though. There’s definitely something to be said for car camping. Depending on your vehicle, it may not be the most spacious arrangement, but there’s no doubt that it’s one of the most convenient. Also, if you invest in a big tent that fits in your car, you can improve your temporary living facilities. If you’re interested in prices and features, take a look at our car camping tent reviews – you won’t be disappointed! So it goes without saying that not every car is optimum for spending the night, especially for more than one person. If you’re driving a Porsche or a Rav 4, you might consider just pitching a tent. However, some cars were made for the journey and the destination. They may not be the coolest, they may not be the easiest on gas, and they make be a little tricky to parallel park, but it is way too much fun to have a bug out vehicle to be worrying about that. 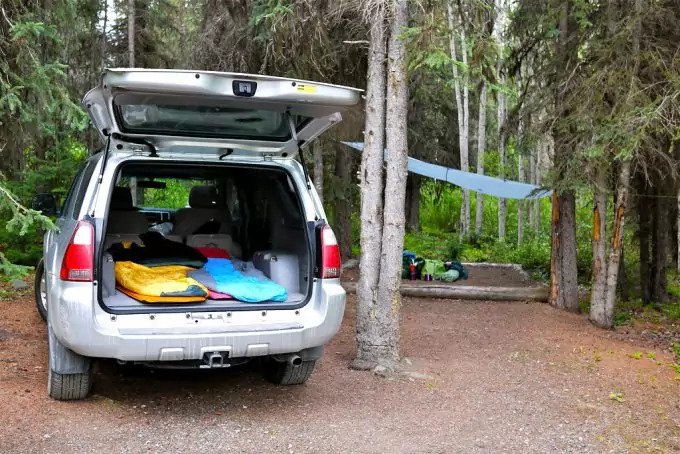 Here are a few of the roomiest and most practical vehicles to spend the night in. Want to know why it’s listed first? Because it’s my absolute favorite bug out vehicle. No questions asked. Sure, it has a legendary reputation for costing $80 to fill up (if gas is cheap), and it gets maybe 10 miles to the gallon, but what this beast lacks in gas mileage it makes up for in space and general awesomeness. First of all, these vehicles seat up to 9 people, with a third row option put in. 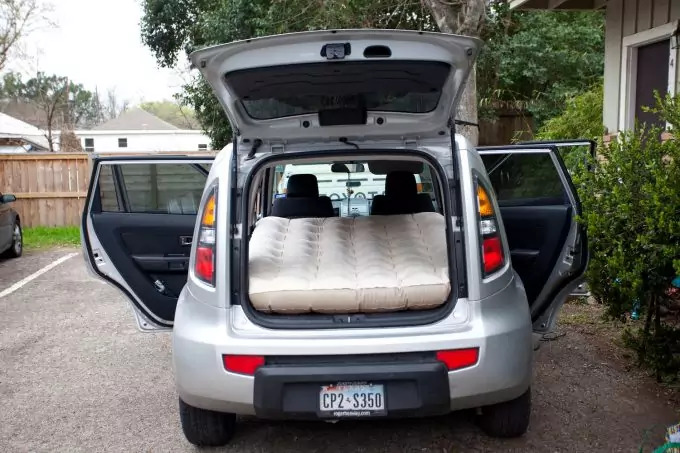 Then, if you decide you don’t need all those seats, you can take them out, revealing a massive cargo area that will definitely fit a full size air mattress comfortably. Depending on the year it was made, it’ll either have a tailgate hatch door with a roll down window, or my favorite-barn doors. These things make loading and unloading your gear easy as pie, and save you from worrying about busting your head on a hatch overhead. All of this coupled with its high clearance, powerful engine, and extreme adaptability makes it rugged enough for wilderness camping, and spacious enough for the whole family. At the other end of the spectrum, we have a much more fuel efficient vehicle. These cars get in the range of 25-30 miles to the gallon, and even have standard all wheel drive. They may not look it, but they have quite a bit of ground clearance for traversing rough terrain. 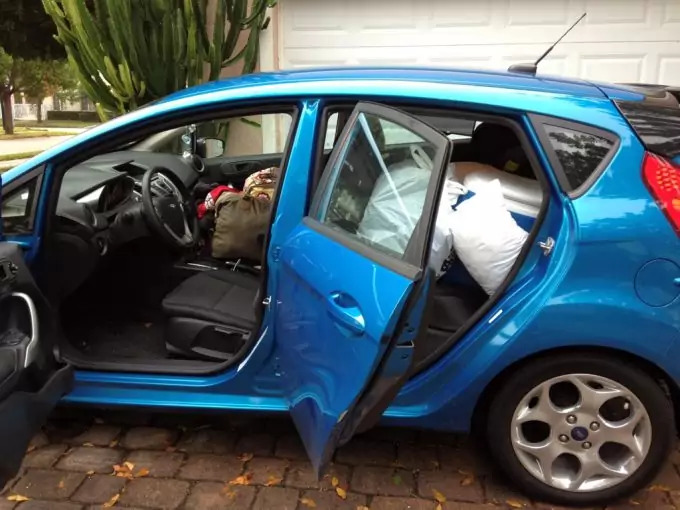 This coupled with their ample cargo space make them a great candidate for spending a night in. This is a car that earned a reputation for being a rough and rugged off-roader, perfect for adventurers and weekend explorers alike. It has all the standard bits that make an SUV tough enough for camping, including four wheel drive, high clearance axels, and great shock absorption. However, where it really shines are its advanced off-roading systems that automatically adjust specifically for the type of ground you’re covering. And of course, once you fold down the back seats, you’re left with plenty of cargo room to stretch out in the back. No matter what you’re driving, just make sure you can sleep in it without cramming your head into an armrest. An absolute must is that you be able to fit three quarters of your height in the back without running into any obstacles. Smaller, more compact vehicles just don’t fit the bill. 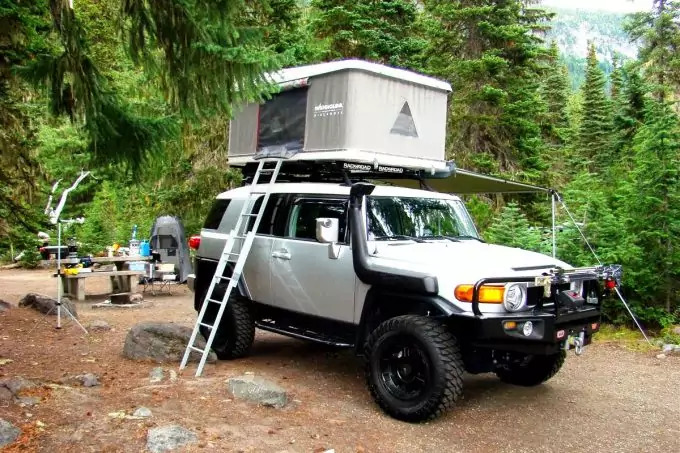 So now that you’ve (hopefully) figured out which car you’re going to be camping in, you’ll want to make sure it’s well stocked with the supplies necessary for this type of camping. 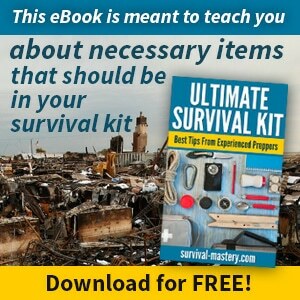 Sure, you’ll need your usual gear like fire starters and sleeping bags, but there are a few other items-some optional, some not-that will make it a safer and more enjoyable experience. Here are a few things you can pick up before your slumber roadside. If you have a big enough cargo area, you can use this option for a cushier sleep. While air mattresses aren’t always practical for standard camping trips, in a car, you’re protected from sharp protuberances and moisture, so there’s no risk of puncturing the vinyl or the pump getting fried by condensation. Plus, there are even air mattress pumps these days that you can hook up to an adapter and power through your cigarette lighter-no more spending $30 on a case of D batteries! For in-depth product information, take a look at our in-depth reviews on the best air mattress on the market money can buy. Turn up the romance! While these massive sleeping bags may not be the easiest thing to pack into the woods, they’re excellent for staying warm with a special someone in the back of your car. Not only can you turn a roadside campout into a romantic evening, but you get the added benefit of being enveloped in down while also sharing body heat-great if you don’t want to run the heat all night. Some like this one from Teton Sports even have a good for extra coziness, and come in queen sizes so the whole family can snuggle up in the great outdoors. How’s that for a co-sleeping arrangement? We have more similar products in our article on the best sleeping bags while camping so don’t forget to take a look! Sure, you can turn on your dome light when you need some illumination in your car, but as we all know, this can drain your battery, leaving you stranded in the morning. Naturally, you don’t want to use any flammable sources of light inside the vehicle, so butane and kerosene lanterns are totally out of the question. Don’t despair though, there are plenty of portable, clean sources of light that you can use to light up your night. LED lanterns are a great way to produce a ton of light, without burning through a bunch of batteries. I have this one from Coleman, and I can honestly say the batteries have lasted a couple of years through power outages and camping trips alike. It’s super bright, and very lightweight. To add to its energy efficiency, use some rechargeable batteries. We had the amazing chance of reviewing some great products in this category so, if you want to know more, read our article on the best LED flashlight for campers. But let’s face it, car camping is like pitching a tent in the backyard when you’re a kid. There’s a certain novelty and whimsy to it, so try not to take it so seriously. Have fun with the lighting, and create a little ambience while you’re at it. Get some battery powered LED lights, and string them along those coat hanger hooks on the inside of your car. Again, rechargeable batteries make these last a lot longer, and the cash in your pocket too. Turn up the awesome even more by screening a movie in your car. You’re in an airtight shelter, so take advantage by using some high tech gadgetry to put on a movie. Tape some paper over your rear window and turn it into a movie screen with a portable battery powered projector. This one by Asus gives you an hour and half of battery life with its rechargeable battery, and is compatible with all kinds of different devices. If you want to watch a lengthy flick though, read on to the next topic for getting power in your car. This is one of the unsung heroes of car camping – and even more so of lengthy road trips. Power inverters plug into your cigarette lighter, and give you a traditional socket to plug in electronics (though of course there is usually a power limit). They’re great for camping and road tripping, but really are an excellent component of your vehicle’s bug out kit. This one by BesTek even offers two outlets. Use it to power a laptop and charge your projector while you play movie on the window of your SUV – how cool is that? 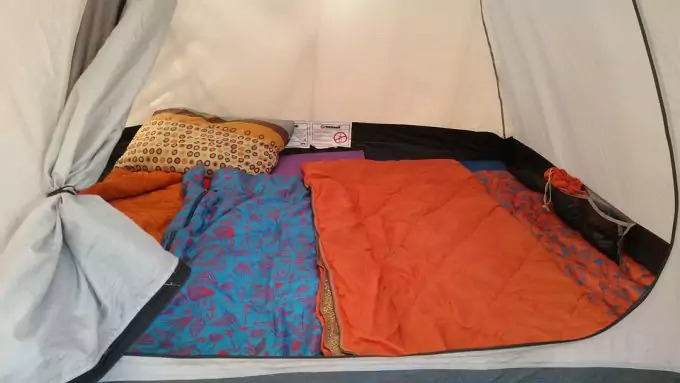 Okay, so I know this is seeming less and less like an article about camping, and more like a party car conversion how to, but like I said before, car camping offers certain luxuries that you just can’t get with tent campouts. If you’re going to set up a movie screen, or even just want to play some music without draining your car’s battery, consider getting some portable bluetooth speakers like these by DKnight. If you’re driving a pickup, don’t despair. 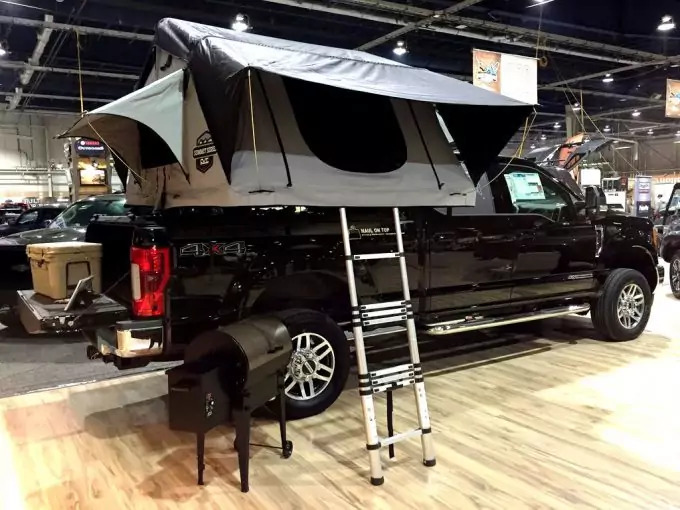 You can still use your ride as your home away from home by setting up a truck bed tent. Yep, they exist, and they are awesome. They come in a few different sizes, so measure the bed of your truck before you order one. Though you won’t have quite as much of a water and weather proof camping experience, you can still stay off of marshy or rough ground, and drive right in and right out of your campsite. 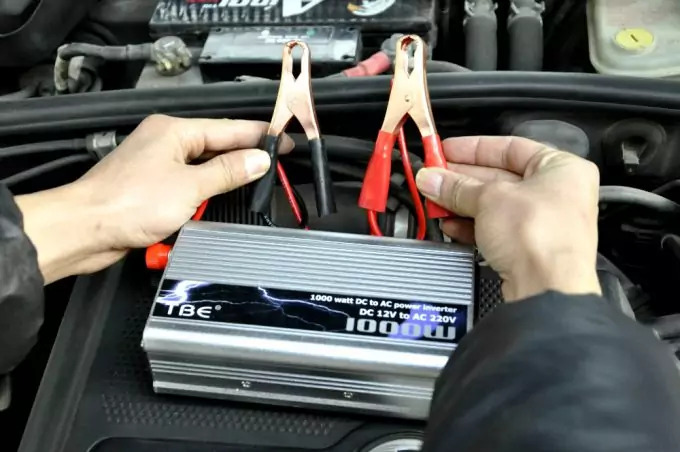 Again, take advantage of the fact that your car is a power source (just be careful not to drain your battery). If it’s really cold out, and that queen size sleeping bag still isn’t cutting it, invest in an electric blanket that hooks into your cigarette lighter. 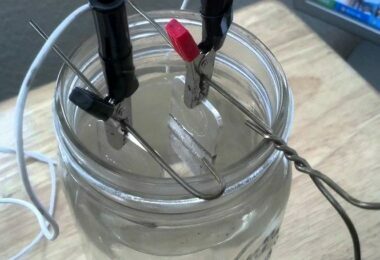 They use very little power, and are generally available for under $50, depending on the one you get. These are also just a great emergency measure to have in your car, in case you get stranded in the middle of some very cold weather. These are just a few things you can pick up to make staying the night in your car more than just frugal, but downright cool. 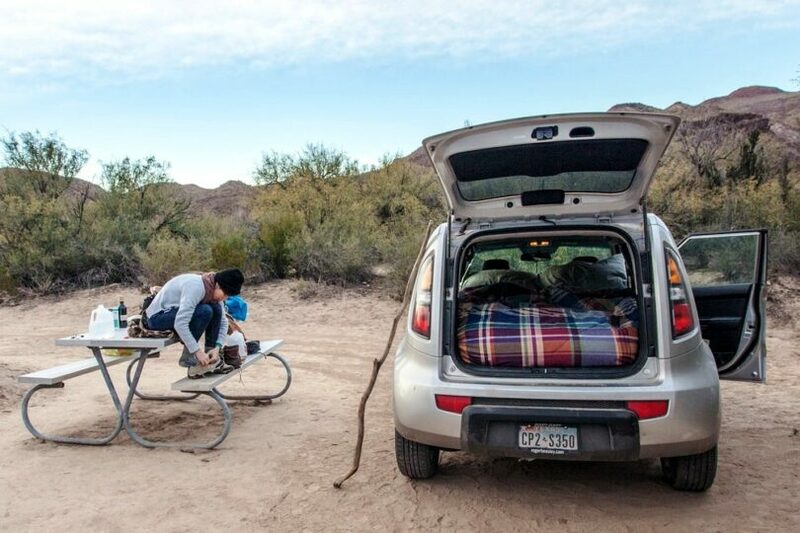 Whether you don’t feel up to hoofing it to a campsite, the weather’s terrible, or you’re just looking to create a cozy romantic escape for you and someone special, car camping has some serious perks that shouldn’t be overlooked. Make the most of it with some special gadgets, and turn it into an experience. While camping out in your car can be awesome, it can also be a little risky. Since you’re going to be spending the night in a place that will be accessible, that means that you’re not the only that can get there. Like I said earlier, people can be your most cunning predators, and they’re pretty much the only ones you need to worry about when you’re car camping. You’ll want to take some special precautions to keep you and your family safe. First of all, if you’re on a road trip and camping out of necessity to save money, the last thing you want to do is camp along the side of a road, particularly a highway or interstate. Not only are you just asking to get hit, but in many places this is actually illegal because of the safety hazard it poses to you and other drivers. Secondly, you always want to make sure to lock your doors. You never know who may happen by when you’re asleep, and the last thing you want to do is present a potential thief or criminal with an easy target. Lock all of your doors, and if you must leave your windows open, only crack them enough to ventilate the space-not enough for someone to get in. If you’re camping in a place frequented by bears, make sure to seal up your food. Though you’re certainly safer from these curious predators in a car, they can still be lured to your location by the smell of pungent or open food. They may not be able to get in, but they can do some serious damage to your car in an attempt to get at a bag of chips. I’ve talked to many people that have had bears bust out their passenger side windows trying to get to fast food they left in the car. Don’t take the chance – bring an airtight container or cooler, and put your food away when you’re done. This may go without saying, but never do any cooking in your car. 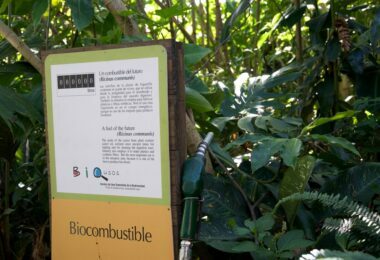 It’s obvious that you don’t want to use anything that’s going to produce an open flame, but even electric burners in such a confined space are extremely hazardous. Cars are covered and filled with polyester and chemicals that often accelerate fires, and it would be very easy to start one with just a simple slip. Play it safe-even if you’re just using a portable hot plate, do all of your cooking outside. You’ll also want to make sure that wherever you park, you can get out of in the morning. Though waterside sites may seem optimal and scenic, a spontaneous rain shower can make water levels raise quickly, putting you at risk for being washed away by high water. Try to avoid pulling off road if the ground is moist or soft, or covered in snow. As the sun rises, overnight frost often gives way to morning dew, saturating the ground. Don’t get stuck in the mud in the morning when you go to head out. Lastly, make sure you come armed with some personal protection. Even if you take all of the necessary precautions and select a well lit, secure location, if someone tries to break in, or a bear decides you need to share your dinner, you need to have a way to defend yourself. Have a practical weapon close at hand that you can use in close quarters (that means no rifles-there’s not exactly space to swing that barrel around in your compact SUV). For bear defense, usually the best bet is bear mace. However, if you’re trying to fend off a hungry critter with a can of mace, you’re likely to get yourself just as bad by unleashing it in the confines of your vehicle. Typically, the best bet for defending yourself from bears and people alike in the tight space of your car is going to be a small firearm, like a pistol or revolver, that’s easy to aim and has little kickback. Don’t wait until a threat appears to get it ready. When you get to your campsite, have it loaded and ready to go, within easy reach. Just remember to properly put it away before you hit the road again the next day. Follow these basic safety principles, and you can protect yourself from the threat of everything from wildlife to crooks. 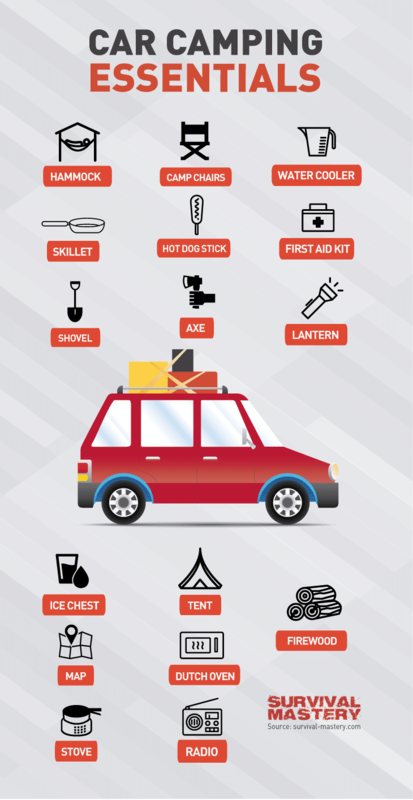 So let’s recap on basic car camping essentials. Whether you’re spending the night in your car on a cross-country road trip, or taking the kids to see Yellowstone in the back of your Suburban, you can turn the close quarters of a vehicle into a safe, whimsical, portable campground.